Bundt style 14-inch aluminum wheels (as seen here) were first introduced in 1969 on models such as this 280SL. Observing the performance and handling benefits that lightweight aluminum alloy wheels brought to Porsche models during the 1960s, Mercedes-Benz was inspired to create their own. After relentless testing, a final design was approved during 1969 and the Otto Fuchs company of Meinerzhagen, Germany was given the contract to produce 14-inch aluminum wheels for Mercedes beginning that summer. Known officially as “Premiere” wheels, they quickly became known as “bundt” style rims because of their visual similarity to cakes of the same name. Along the way, the wheels also picked up the nickname “barock” (German for baroque) because of their above-average level of ornateness. The 14-inch bundt wheels were manufactured with a forging process that uses high temperatures and pressures to realign the grain structure of the aluminum. Once this process is complete and the grain of the metal faces one uniform direction, aluminum can attain the strength of steel with much less weight. The forging process is complicated and expensive, and Mercedes-Benz dropped it in favor of cast poured wheels after 1985 when the Bundt wheel’s 15-year run ended. Forged wheels are far less likely to become bent over bad roads because of their rigidity, and the price premium they command can be worth the extra cost – especially if you’re running low-profile tires. At first, 14-inch Mercedes bundt wheels could only be attained as a dealer-installed accessory rather than as an option on the factory order sheet. Eventually, they were made a proper factory item, and sales improved. In the first part of the 1970s, the 14-inch Mercedes bundt wheels were a dealer-installed accessory rather than an option that could be checked off on the order sheet. As sometimes happens when certain options are installed at a dealer rather than on a factory assembly line, they simply don’t catch on as well. Perhaps it’s a subconscious perception of a lower quality level. Or perhaps it’s resistance to automobile dealerships’ age-old tendency to mark up accessory items 1,000 percent – paint sealant being one example that springs to mind. The 14-inchers became more popular gradually, and by the mid-1970s they became a straight factory option. At first available only in a 6-inch wide size, the 14s were later produced in 5.5-inch and 6.5-inch widths. 15-inch versions of the Mercedes Bundt wheels were first made in the mid-1970s for high performance models such as the 450SEL 6.9 and the Euro market 450SLC 5.0 (1980 SLC 5.0 with 15-inch bundt wheels shown). During that time, Mercedes-Benz product planners also conceived 15-inch aluminum bundt style wheels during the mid-1970s – envisioning their performance-enhancing benefits going to use on 450SEL 6.9s and limited production 450SLC 5.0 models in the pipeline. Fuchs Wheels produced the larger wheels as well, and their design was carried over to the bigger size with virtually no changes to the proportions. The center hole, bolt holes, and offset angle were the exact same to ensure 15’s and 14’s could be interchanged on any model of the day. But similar to how the 14-inchers were at first, the 15-inch bundt wheels ended up being relegated to being nothing more than a dealer-installed option. A complete lack of marketing and customer awareness led to little interest, and their high cost due to low initial production was enough to put off most who did inquire. It’s safe to say 99.9% of all Bundt wheels made during the initial run were 14-inchers. One fail-safe way to tell any original Fuchs-made factory wheels from aftermarket ones is the locations of the serial numbers. Fuchs wheels have them on the inside (as seen here), and aftermarket wheels have them on the outside. Because the internet is ripe with half-truths, I gave Tom Hanson (Parts Manager at Mercedes-Benz Classic Center) a call to find out more about 15-inch bundt wheels. We discussed the most popular knockoff versions that would be easiest to find. None of aftermarket imitations have been produced for decades, but used ones can make a good value purchase for the classic MB owner who doesn’t mind their visual differences…or refinishing them. 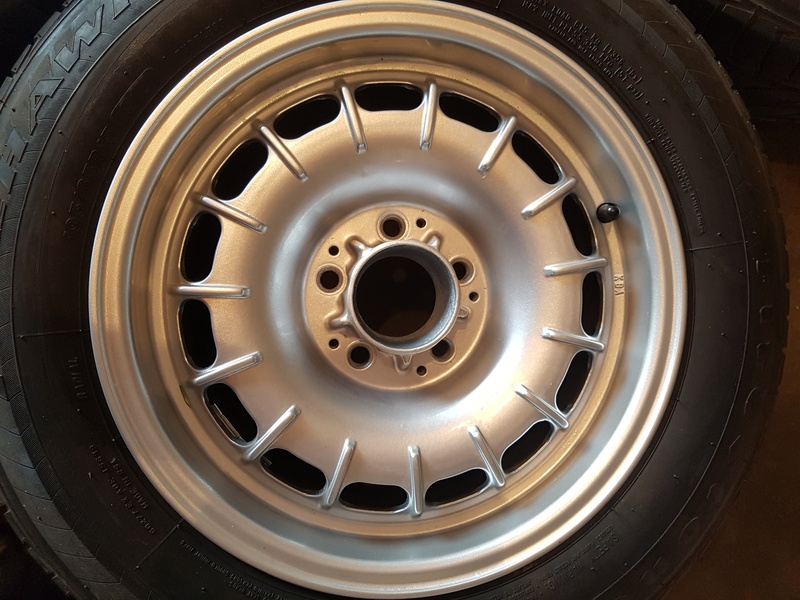 Although all of the aftermarket brand bundt wheels are cast aluminum and not as strong as Fuchs factory ones, the likelihood they’ve been dented to an out-of-round state from potholes in the road is still low. These wheels were mated to higher-profile balloon tires that absorb shock well, because the vehicles they were fitted to were not meant for extremely aggressive driving. 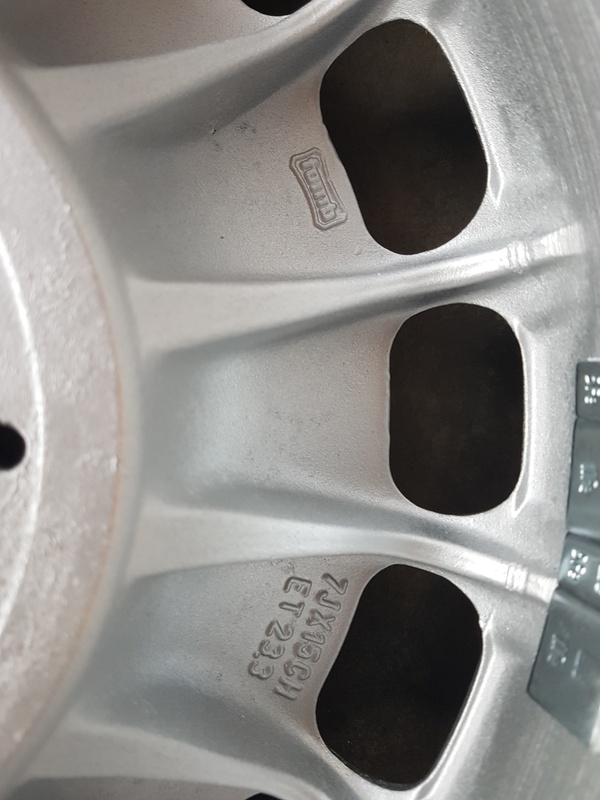 Fuchs factory wheels always have stamped numbers on the inside of the wheel, and aftermarket wheels always have them visible on the outside. ATS aftermarket 15-inch Bundt wheels feature a wider lip than OEM ones, and are a great choice used for someone who prefers the look of a “deep dish” wheel. ATS Wheels, based in Germany, produced lightweight wheels for Porsche, Volkswagen, and AMG during the 1970s and 1980s. While they are most well-known for their 5-spoke “Penta” aluminum wheels equipped on Mercedes-Benzes modified by AMG during that period, ATS Wheels also created knockoff 15-inch Bundt wheels based on the original Fuchs design. No longer produced today, they are the easiest ones to find used on ebay and other internet retail sources. Distinguishing features of ATS aftermarket 15-inch bundt wheels are the company logo stamped on the outside of the rim. ATS bundt wheels feature a center wheel area that looks very close to the original. Upon closer inspection, one notices how the wheel rises up higher in the center area than OEMs, then drops off more steeply as it approaches the outer rim section. When viewed from a three-quarters angle, this deeper inset leads to a more pronounced wheel lip. If you’re standing by the car looking down at the wheels, the vent holes appear larger because of the increased bundt cake center rise. While it’s strictly a matter of personal preference, ATS wheels are the best choice for someone who wants to add aggressive visual flair. Compared to original bundt wheels which have rounded off spokes near the center hole and vent holes, ATS spokes are sharply squared off in shape. On the outside of the wheel between the vent holes and the wheel lip, you’ll see a stamping that reads “made in Germany” along with “ATS” next to it. 15″ Centra aftermarket bundt wheels have a larger amount of vertical filler in the space between the 15 vent holes and the outer wheel section. Centra Wheels (no longer existent today after being purchased by rim manufacturer Ronal), produced 15-inch bundt knockoffs. Centra bundt wheels have a center section with shapes and holes that come closer in size and shape to the original 14-inch wheels. However, they reach their 15” diameter by way of filler in the space between the 15 vent holes and the outer wheel section. Centras have a less severe outward curve on the Wheel center “bundt” section, so they appear more original until you notice the overall proportions are different. Like ATS wheels, Centras have a deeper dish shape to their outer perimeter and they have more squared off spokes surrounding the center hole and vent holes. If you’re standing by the car looking down at Centra wheels, the vent hole slots appear smaller and narrower because of the lower bundt cake center rise. ARC aftermarket 15-inch bundt wheels look very similar to more popular ATS ones, but feature more stampings on the outside. ARC spokes are longer and reach further toward the center of the wheel. ARC 15-inch Bundt wheels are closer in overall appearance to ATS’s design but have a flatter center area. They do not have the larger filler section between the center bundt and outer wheel rim that distinguishes Centra rims, but they do have the squared-off outer rim lip. While ARC spokes are squared off the way ATS and Centras are, ARC spokes are longer and reach further toward the center of the wheel. ARC wheels typically have more stampings on the outside of the rim than the other aftermarket wheels. A 1972 Mercedes 280SE equipped with factory authentic 15-inch Fuchs aluminum wheels. Today, Fuchs is still in business and still uses the same design for 15-inch Bundt molds as they did in the 1970s and ‘80s. According to Hanson, Fuchs has never stopped making these wheels. 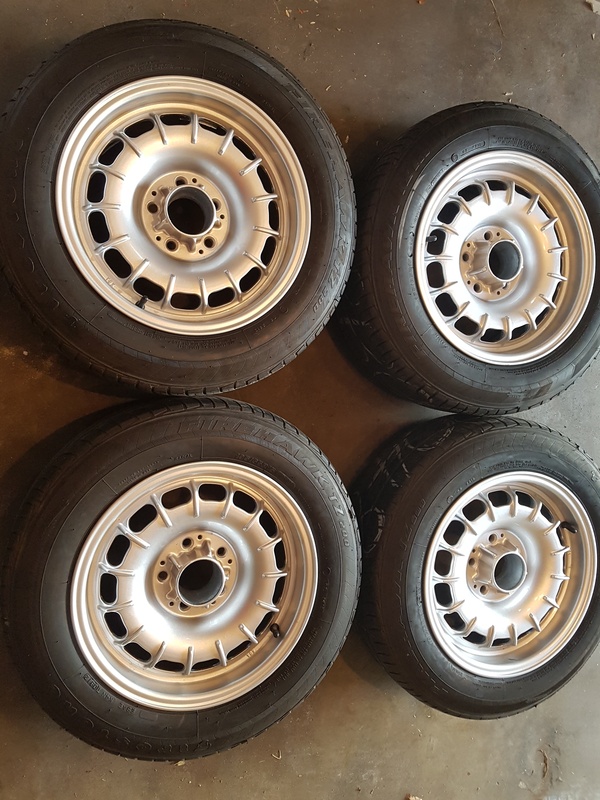 Demand for them used to be low, but as the decades have passed and 1970-85 models are seeing greater restoration interest, Mercedes Benz owners seeking authenticity value the original proportions the 15 inchers are faithful to, and appreciate the way their greater size fills the wheel wells. Fuchs typically produces a run of 800-1,000 15-inch bundt wheels a year to meet demand – up from 100-200 twenty years ago. While Fuchs 15-inch wheels are produced in only one width of 7 inches, it’s a size that is much easier to find tires for than the 14-inch wheels. This less popular and less authentic looking bundt wheel knockoff was made by Ronal during the 1980s. The good news about Fuchs wheels produced at the factory today is that they are made to the exact same high specifications they always have been. With Mercedes-Benz parts, that’s a good thing. Forged construction methods really do make them stronger and less likely to crack or deform than any aftermarket ones. Like vintage originals, new Bundts also have steel inserts that serve as sleeves where lug bolts pass through. Think of them as a giant washer with threads that the wheel bolts sink into. Their bolt pattern diameter, bolt hole size, center hole, and offset are all designed to allow 15-inch Bundt wheels to fit perfectly onto on any Mercedes-Benz that used 14-inchers. Campagnolo made these Bundt imitation wheels during the 1980s. Looking at them, it’s easy to see why they were never a big seller. Should you even choose to swap 15-inch Bundt wheels onto a 1986 or newer 560SL or 560SEL, for example, they would fit with no problems according to Hanson. Center caps and original style steel valve stems will transfer over from 14-inch wheels as well. The opposing bad news is that if forged wheels become damaged, they are more difficult to repair than cast aluminum ones. Factory 15-inch bundts also come painted in the authentic silver color that’s correct for the period of their original run. They also come with a clear coat hard shell protective layer applied on top of the paint. CLICK ON ANY OF THE PICTURES IN THE SLIDE SHOW BELOW TO EXPAND TO FULL SIZE. ATS Wheels, based in Germany, produced lightweight wheels for Porsche, Volkswagen, and AMG during the 1970s and 1980s. During that period, ATS also created knockoff 15-inch Bundt wheels based on the original Fuchs design. Out of production for decades, these are the easiest ones to find used. “Made in Germany” is stamped on the outside of all ATS aftermarket 15-inch bundt wheels. Some have the ATS logo, and some don’t. When viewed standing above the vehicle, it’s easy to notice the slightly larger size of the vent holes on ATS 15-inch bundt wheels. Centra Wheels (no longer existent today after being purchased by rim manufacturer Ronal), produced 15-inch bundt knockoffs. When viewed from the same angle as ATS knockoffs, Centras have a visibly larger amount of vertical filler in the space between the 15 vent holes and the outer wheel section. When seen next to each other, ARC aftermarket 15-inch bundt wheels (on right) look very similar to more popular ATS ones (left), but feature more stampings on the outside. ARC spokes are longer and reach further toward the center of the wheel. An aftermarket 15-inch bundt wheel of unknown brand origin. Notice the higher-than-stock “rise” in the center area when viewed from this angle. Aftermarket 15-inch bundt wheels made by Campagnolo. These do not come close to any look of authenticity when compared to originals. This entry was posted in Informational articles and tagged 14-inch, 15-inch, 1969, 1970, 1970s style, 1971, 1972, 1973, 1974, 1975, 1976, 1977, 1978, 1979, 1980, 1980s, 1980s style, 1981, 1982, 1983, 1984, 1985, alloy, aluminum, aluminum wheel, barock, baroque, baroque wheel, bundt, bundt wheel, factory, for sale, Mercedes, mercedes classic center, mercedes-benz classic center, new, oem, original, wheel, wheels, where can i find. Bookmark the permalink. You might be interested on INTRA bundt wheel…it’s pretty common here in Indonesia. and also My Father still have a set(5 pcs) of FONDMETAL bundt wheel, still installed on his Mercedes W110. who makes Mille Miglia wheels. information on FOMB 15″ Bundts. You have not mentioned about size 8.5Jx14H2, seems they were stocks for w123 280 or so..
sean, I have a 300SEL, 1990. Will the bundt wheels in your article fit my 1990 300 SEL? Hi Sean. Thank you for creating this article, for using my images to reference the Centra (on my yellow ’83 300D, it’s not an ’84 with ATS). I also took the images of the Ronal 14″ bundt (installed on a w113 280SL) and Campagnolo 14″ wheels (installed on a w123 “lang” version) overseas, probably a decade ago. One thing I note about the Centra is that the spokes are actually longer (reach more inward) than the others. You keep mentioning this was a feature of ARC wheels. The Centras also do have a flatter center area compared to others. It’s safe to mention too that none of the aftermarket 15″ bundts have “built-in” lug bolt “washers” like the Fuchs wheels do. At least, I’ve never seen any. It’s probably also a good idea to mention the two types of 14 x 6 bundts – those with 108 part number, and those with 126 part number. There were variations with the tire valve design. I believe the 15″ Fuchs bundt wheels followed the later 14″ design since they have a p/n starting with 126. I had 15″ Centera and they did not fit a 1989 R107 SL Even though correct ET the spokes hit the brake callipers in the front (post 1985 facelift 107:s have the same lager brakes as the w126 facelift cars). I would have needed åt leadt 20mm spacers which was not an option. I thought it wad the Bundt design but maybe original Fuchs 15″ would have been OK then?